We had planned to leave Charlottetown on Wednesday morning, following the Ladies Sailing Night, but the weather was uncooperative. A heavy fog rolled in the night before, and although the harbour itself cleared up later in the morning, the fog bank sat just outside the harbour for most of the day. Since there was no particular reason to risk a voyage with very limited visibility, we decided to stay one more night. 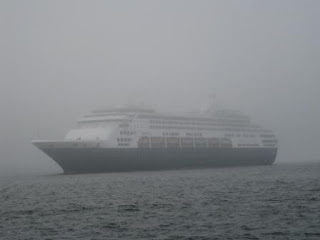 Later in the morning, we heard a fog horn blast. A couple of minutes later, it was repeated, and then again a couple more minutes later, getting closer each time. We poked our heads out of the cabin, but couldn't see anything. A few more fog blasts later, we finally started to see a large shape coming through the fog. A cruise ship was coming into the harbour, but with the thick fog we couldn't see it until it was halfway from the mouth of the harbour to the dock. It was interesting to watch this massive ship slowly materialize as it made its way closer and closer to us. On Thursday, we finally left for Summerside. 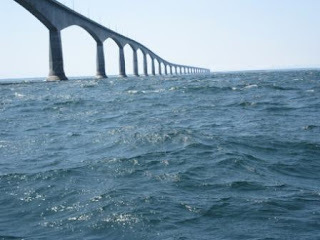 Again, just as we did coming from Montague, we wanted to take advantage of the tides and currents, as we've heard stories from other frustrated sailors trying to fight the currents through the area of the Confederation Bridge. This necessitated an early morning departure, by 0600 at the latest. We got underway shortly after 0500, and it was a beautiful dawn. Unlike the previous morning, there was no sign of the fog and there was a steady 10 to 15 knot wind. We motored out of Charlottetown Harbour and around St Peter's Island with the wind directly in our face most of the time. Because of the long sand banks running off of St Peter's Island, we had to give it a wide berth, which took some extra time. But shortly after making the turn, we were finally able to put up the jib and take advantage of the wind. The water was a bit choppy through the whole trip, since the wind was coming from the south-west, while the currents were heading in the opposite direction. It certainly wasn't uncomfortably rough, but it wasn't a smooth ride either. After a couple of hours of cruising along steadily under jib alone, the wind started to ease a bit, and dropped to 7 or 8 knots. We put up the mainsail and brought our speed back up again. However, this was somewhat short lived, as the wind suddenly picked up to 15 knots, gusting to 20 or higher. This is overpowering for our boat with both sails up, so we quickly had to drop the main, which is somewhat challenging when the boat is bouncing. But this was easy compared to a bit later, when the wind picked up again, and we decided to reef in the jib. We still have a bit of a problem with this new jib, and of course the reefing line picked this time to jump from the reel and jam. This required a trip to the bow to furl the jib. By the time I had finished this task and made my way back to the cockpit, I was soaked from head to toe. My blue pants soon turned white as the salt water evaporated. 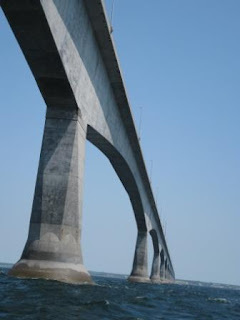 Now was the highlight of the trip - our first time under the Confederation Bridge. Perspective is always tricky from the surface of the water and it looks like the mast is going to hit the bottom of the bridge, but there is plenty of room to spare. Of course, you can see the bridge approaching from miles away. We used the GPS to tell us how far away it was, and even from two or three nautical miles out, it is so large that is seems like we're right next to it. As you approach, the view from below is quite impressive, looking at the spans of the bridge disappearing off into the distance. The width of the bridge from below is surprisingly narrow, given the height of the pillars. The rest of the trip was quite uneventful and peaceful. Shortly after crossing the bridge, the wind let up a bit, and we unfurled the jib, and sailed the rest of the way into Summerside. It's been a but frustrating, sailing-wise, so far this summer. Our store, The Turret Bell (check it out at http://www.turretbell.com/) has taken up much more time than we had planned, and our sailing has been pretty limited since we got back to Canada from the BVI. But yesterday, we were joined by some friends for the first leg of our first cruise of the summer. We had planned to make a trip to Shediac last summer, but that voyage was scuttled when we had some engine problems. We haven't yet made it farther west than Charlottetown with Obsession, so that trip was a priority this year. We left Montague at 6:15, trying to time our trip with the tides. Low tide was to come at 8:44 in Murray Harbour, so we wanted to be running with the rising tide as we traversed the southern coast. After our usual motor out of the river, we raised our sails shortly after we passed Panmure Island. The wind was out of the south-west at about 10 kts, and we had a great sail for a couple of hours. Only problem was, the wind was coming from the direction in which we wanted to travel, and we were now bearing for Nova Scotia. So, we reluctantly furled in the jib (leaving the main up for now) and motored into the wind to get around Cape Bear and the south-eastern tip of PEI. We took advantage of the motoring time to make some lunch, but now it was late morning and the wind decided to die down to almost nothing, as it often seems to do in this area. The water was quite steady with just a small roll, so it was a very comfortable cruise. We had on board with us an exchange student from Vienna, Austria. Being from a land-locked country, she had never been sailing before, and spent her time looking for marine life. We spotted a few seals, but no whales or porpoises. Finally, by mid-afternoon we were well past Wood Islands, and the wind was picking up. We killed the engine and put the jib back out, and slowly moved along for a short while. It wasn't long before the wind had picked up again, and we were sailing on a beam reach around Point Prim and into Charlottetown at over 6 kts. Coming into Charlottetown, the wind was strong enough that we furled our jib partway, but we contined sailing all the way through to the end of the harbour and to the Charlottetown Yacht Club. 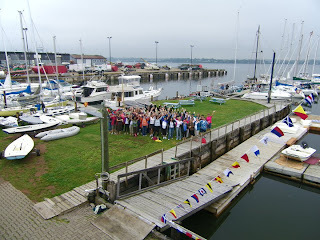 We had called for a spot at the CYC, and when we arrived, they came out to help us tie down. The CYC has pretty good and complete facilities (although they are showing their age somewhat) for about $45 per night. However, we were a bit surprised that they no longer provide diesel fuel, and I wasn't clear whether or not this is a permanant situation. There is diesel available around the corner at Quartermaster. The biggest frustration I have with them is that they lock down everything at night, and don't have keys for visiting boats. They say that the night watchman can let you in, but more often than not, finding him is more trouble than it is worth. We will probably leave the boat here until Wednesday, although we will be back and forth back home to take care of the store. On Tuesday night, Ellen MacPhail of Waveskills Sailing School has organized a Ladies Night sailing - Michelle will be joining in onboard Obsession. Our next planned stop once we leave here is Summerside, and I'm looking forward to passing under the Confederation Bridge.